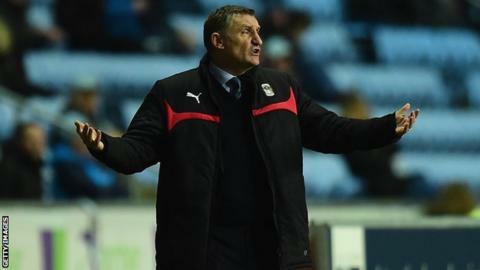 Coventry City manager Tony Mowbray says the League One side still need more "ammunition" up front before the end of the transfer window. The Sky Blues have signed teenager Adam Armstrong on loan from Newcastle but Mowbray says more experience is needed. "We can't hang everything on Adam - he's an 18-year-old boy," Mowbray told BBC Coventry and Warwickshire. "We need some ammunition up front and the right guys will come along and help the team, I'm sure." Armstrong is joined in the City squad by fellow 18-year-old forwards James Maddison and George Thomas, with only 32-year-old Marcus Tudgay offering an experienced option. "Adam's only been training with us a short time so he doesn't really play the way I would coach a centre forward to play, but he's looked sharp," added Mowbray. With Saturday's opening League One fixture of the season against Wigan fast approaching, Mowbray knows he will probably have to be patient about bringing in reinforcements. He continued: "They might not come before the season starts, but if they come two or three weeks in, it's better to have them for the next 40 weeks than not have them at all or have the wrong ones."